Announcement Free personalization on all my cards!!! Free personalization on all my cards!!! Beautiful card. Very high quality paper. Hilary is a lovely seller and very talented artist. 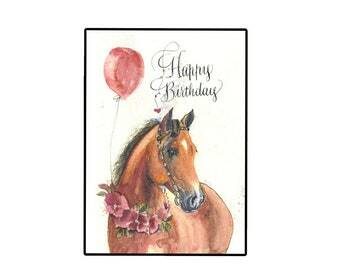 one of my original watercolor horses made into a card. Some of my original art work. A view of my work desk. I try and keep it somewhat organized. The area where I cut and score my cards and bookmarks. A professional calligrapher and watercolor artist. I was a wedding calligrapher in Los Angeles but when my husband and I moved to a smaller town, I had to rethink what I could do to make a living. 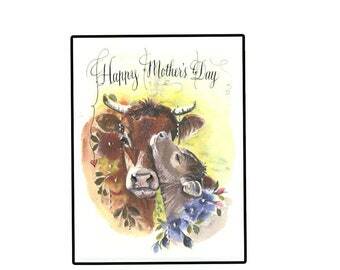 I started painting horses, dogs, cats and flowers and turning them into greeting cards. I absolutely love the process and am very thankful I get to do this on a daily basis. 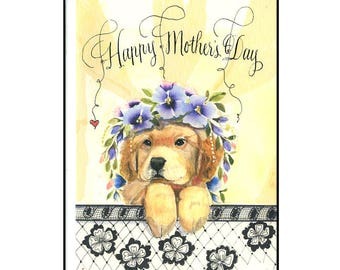 All of my watercolor flowers, horses, cats and dogs I painted in watercolor, then scanned and made into cards with added flourishes and glitter. All my cards are hand calligraphed by me. If you don't like it, return it and I will make you a new one if you would like or give you your money back. I accept checks, credit cards, Pay Pal and money orders. I use USPS First Class mail unless otherwise requested. I take all kinds of custom orders. Please don't be concerned about asking.